Rejuvenating Alaska’s large vessel fishing fleet could be nearly an $11 billion boon for Outside shipyards, according to a new McDowell Group report. The Alaska-based research firm pegged $11.3 billion as the cost to completely replace the 414 fishing and processing vessels longer than 58 feet that participate in North Pacific fisheries off the coast of Alaska in a study commissioned by the Port of Seattle and the Washington Maritime Federation. Regulations generally require boats in Alaska’s salmon fisheries to be less than 58 feet, which makes that length the common delineator between smaller boats focused on near shore fisheries and larger vessels that fish and process catch in federal waters at least three miles offshore. Additionally, most of the more than 5,000 smaller commercial fishing boats that operate in Alaska homeport in the state and nearly all of the larger vessels in federal fisheries have Puget Sound addresses for a host of reasons. While the $11.3 billion baseline figure includes the cost to eventually replace a dozen vessels among the 414 built since they year 2000, according to McDowell Group the fleet averages 40 years old and 87 percent of the vessels were built before 1990. To that end, the study estimates it would cost nearly $9 billion to replace all of the North Pacific fishing vessels more than 30 years old and about $4.4 billion for those at least 40 years old. There was no way for vessel owners to replace much of the fleet until federal regulators in 2012 and 2014 lifted restrictions on transferring vessel-tied fishing permits in acknowledgment of the aging fleet. The most expensive vessels to replace are naturally the largest in the North Pacific fishing fleet: the three, 300-plus foot processors at $170 million apiece and 16 dual-purpose catcher-processor vessels that average 285 feet at a cost of $130 million each. These vessels are primarily focused on pollock, the small whitefish that comprises the bulk of the offshore Alaska catch. Replacing the vessels that make up most of the fleet would cost $15 million to $18 million apiece for the smallest crab and trawl boats and up to an average of $78 million for smaller — generally less than 200 feet — catcher-processors that are part of the Bering Sea-Aleutian Islands “Amendment 80” groundfish trawler fleet, according to the study. How quickly the North Pacific fleet gets new additions depends on a host of factors, some of which are nearly as variable as any one fish’s location in the immense Gulf of Alaska. Modern engines and hull designs can improve fuel efficiency by up to 30 percent on new vessels, according to the study, and a strong impetus for new construction, as is the ability to integrate value-added processing equipment on new vessels. However, vessels participating in fisheries such as crab that have few on-board, value-added possibilities are much less likely to be replaced, the McDowell authors concluded. For these reasons, seafood companies that own multiple vessels may be inclined to build one efficient boat to replace two that are of age, which the study states is the circumstance for at least one Amendment 80 trawler currently being built. Conversely, some catcher-processor companies indicated a desire to not consolidate because more vessels fishing naturally means more opportunities to find fish, according to the study. The need to swap out old for new can also depend largely on the maintenance history of individual vessels, the authors acknowledge. “Despite the regulatory and financial benefits of operating new vessels, many owners of well-maintained, older vessels are hesitant to commit to reinvestment,” the study states. The ability of vessel owners to obtain financing with preferable terms — as is the case with nearly all multimillion-dollar construction projects — will also play a large role in how quickly the North Pacific fishing fleet is upgraded. According to McDowell Group, lenders view fishing vessels similar to real estate projects with the addition of some potentially challenging variables. First, the financing need could range from about $10 million for smaller, single-owner vessels to more than $100 million for processors owned by large companies. The one-off nature of large fishing vessels, each with an individual design to meet specific gear type and other ranging needs, is a large risk to ensuring a project can be done on time and within budget. Interest rates between 2 percent and 3.5 percent above the going prime rate are common in fishing industry loans, the report states. A trend in federal North Pacific fisheries towards “rationalizing” the harvest — in which vessel owners are allocated a set quota as opposed to historical derby-style fishing — has helped mitigate some lenders’ concerns about prospective revenue to offset loan payments because the owner is more or less guaranteed a portion of a given harvest. The report notes that harvest quota in rationalized fisheries can often be used as loan collateral, too. Still, the biggest impediment to paying for most new fishing vessels is the “financing gap” that often exists in the industry with very high overhead, the authors conclude. Repaying a no-interest loan for the full cost of a new vessel over the common maximum term of 12 years for commercial loans would in most instances require at least half of the vessels gross annual earnings to go towards loan payments across all North Pacific fishing vessel types, according to the report. To that end, the authors add that the average annual net earnings for the Amendment 80 fleet — the funds a loan would actually be repaid from — were just 15 percent to 28 percent of gross earnings from 2008 to 2012. The end result is a need for substantial down payments to close the financing gap, the report states. Despite the challenges, McDowell Group projects the need for modernizing the North Pacific fishing fleet will lead to 37 new vessels being built over the next decade at a total cost of more than $1.6 billion. Comparatively, 19 new vessels have joined the fleet since 2002. Those figures do not include a number of vessels that have been — or will be — retrofitted or otherwise significantly modified but not replaced. Looking further, the authors estimate three to five new North Pacific fishing vessels per year will be built each year after 2026. They also expect fleet consolidation to continue barring major increases to seafood prices or harvest limits, which could impact the rate of vessel replacement. “The primary driver of this consolidation will be transferrable quota, which will tend to concentrate in the hands of the most successful companies and therefore require fewer vessels to harvest,” the report states. While just more than one-third of historical North Pacific fishing vessel projects have been done by Puget Sound shipyards, McDowell Group estimates that market share will increase to about 50 percent in the near-term, assuming the region’s industry can maximize the benefit of local construction. Additionally, there are inherent benefits for Seattle-area owners in having their vessels built locally, such as the ability to closely monitor the project during construction and a “shipyard and crew familiar with a vessel are well-positioned to provide cost-effective maintenance and repair services in the future,” the report states. Capturing half of the new vessel projects through 2026 would likely result in up to 750 direct and indirect jobs for the Puget Sound region, according to McDowell Group. The primary competitors for the projects are Gulf Coast shipyards Southern states. Gulf Coast shipyards benefit from labor costs — up to half of the cost of a new vessel — that are about 30 percent less than those in Washington and about 45 percent less than Alaska. Also, Alaska currently has just one shipyard capable of building large fishing vessels. 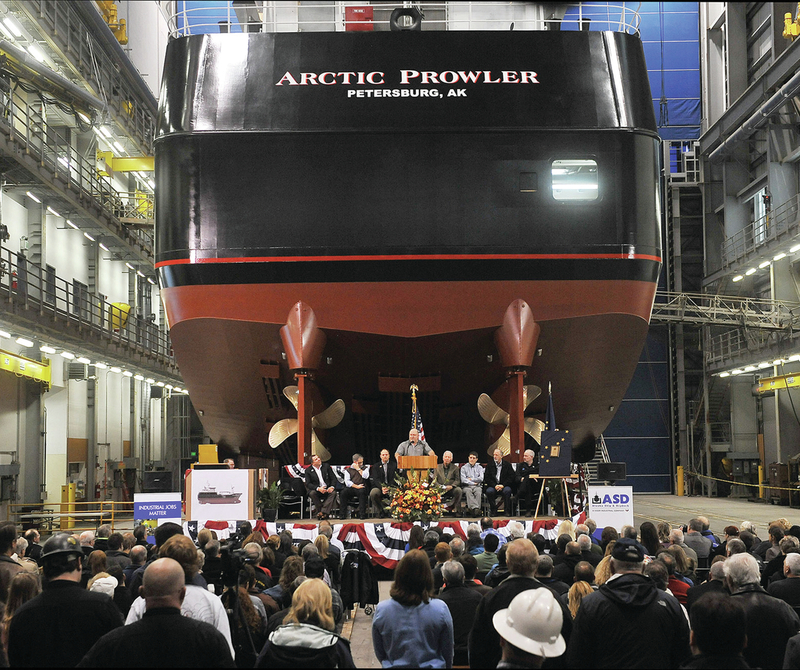 Portland, Ore.-based Vigor Industrial’s Ketchikan Shipyard finished the F/V Arctic Prowler in 2013, a 136-foot freezer-longliner and the first large fishing vessel built in the state.